The county clerk of Big Horn County issues marriage licenses and a certified copy may be obtained at the same time that the license is issued. Information is available at http://www.bighorncountywy.gov/dep-clerk-marriage-licenses.htm. Birth, death, marriage, and divorce records for Big Horn County are maintained and provided at the state level and can be requested here: http://www.health.wyo.gov/rfhd/vital_records/certificate.htmlinstructions and requirements are provided in detail. Birth records are sealed for 100 years; death, marriage, and divorce records are sealed for 50 years. Records in the public domain can be obtained from the Wyoming State Archives at http://wyoarchives.state.wy.us/. 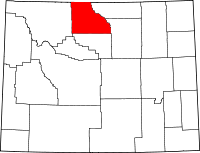 Big Horn County was created by the legislature of Wyoming Territory in 1890.